Maureen O'Crowley, the marketing manager from the Los Angeles branch office of the Korea Tourism Organization lectured at a graduate CEO global training seminar at the College of Hotel & Tourism Management of Kyung Hee University in Seoul during her recent visit to South Korea. Upon learning that Ms. O'Crowley would be in Korea to attend a special shaman ceremony, Kyung Hee Tourism Pro. David Mason invited Ms. O'Crowley to the campus to offer the students a unique opportunity to learn of the strategies and challenges in promoting South Korea as a tourist destination to the US market. Department chair, Prof. An Ock-Mo introduced Ms. O'Crowley to the audience of 60 students that gathered in the school's convention hall on the afternoon of Oct. 15, 2007. Ms. O'Crowley tells The Seoul Times, "This was a definite highlight in my career. It was both a thrill and honor to be invited to Kyung Hee University, Korea's first and finest school of tourism. The students were attentive and showed their dedication to their major. Many undergraduate students chose to attend on their own. I was very impressed by their command of English, not only did they follow my lecture, they laughed at the humorous points as well." To the surprise and delight of the students, O'Crowley opened her speech by introducing herself in Korean adding that though she may not appear so on the outside, at heart she is virtually Korean and calls Korea her second home for good reason. Indeed, she has a long history with Korea. She first arrived in Korea in 1972 as the daughter of a US Air Force liaison officer to the Korean Ministry of National Defense. She spent two years living in Seoul on the Yongsan US Army Compound. She attended Seoul American High School. 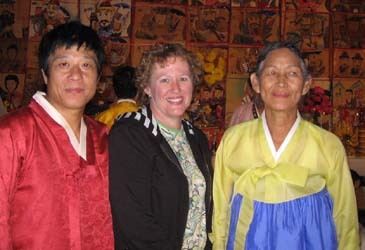 Ms. Maureen O'Crowley (center) poses for camera with famous local sharman Kim Keum-Hwa (right) and an unknown man during a Gut performance held at Keum Hwa Dang (錦花堂) on the island of Gwanghwado in Incheon City. "I was in Korea and I wanted to see Korea — so I made a point to spend as much time off base as possible" O'Crowley, told the students while stressing that this spirit of adventure is vital to the success of tourism majors. 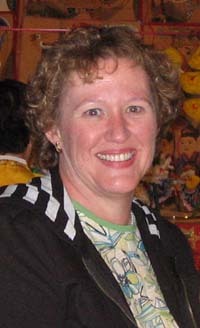 After her father's retirement to Los Angeles, O'Crowley went on to work for Korean Air, obtain a tourism degree and establish a retail travel agency, which she operated for the next 28 years. "Fortunately, the agency gave me a way to stay in touch with Korea — I worked closely with a Korean travel agency over the years doing both inbound and outbound travel to Korea. And of course, I never missed a chance to visit Korea — I don't think I missed a visit to Korea in the past 30 years — some years I was very lucky and came twice!" O'Crowley explained to The Seoul Times. During her address, O'Crowley offered the students both encouragement and advice telling them, "Your prospects are bright. There are many exciting possibilities in the tourism industry and Korea needs you. Seek out a job that you have a passion for. For me, working for Korea Tourism is my dream job — it allows me to combine my tourism degree, my travel industry experience and my love for Korea. Pick a job that you love and you will never work a day in your life." She went on to brief the students on the current activities of the Los Angeles office of Korea Tourism touching on the topics of advertising campaigns, press contacts, tour development and special promotions. Just prior to her departure for Korea, the office committed to the development of a Korea specialist program for travel agents, a project close to her heart that she has advocated for years. She encouraged the students to look at Korea from an outsider's point of view to develop tourism attractions that will appeal to foreign tourists and the need for more hotels and tourism services in the countryside that will encourage travel beyond Seoul. "I just came from Ganghwa Island," O'Crowley explained to the class, "I attended the 'Man Su Dae Dak Gut' of Shaman Kim Keum-Hwa. It was the most spectacular display of Korean culture I have ever seen. I accompanied a journalist, a college professor and five students of Theater Art from Los Angeles. There were other visitors there from the United States, Germany and Mexico too. They were all amazed and intrigued by this ancient ritual of the shaman traditional culture." Then she turned the tables and asked the class a question "Have any of you ever seen such a performance?" None of the young students had. "This is your culture, be proud of it and know that this is what visitors to your country want to see and learn about" O'Crowley stressed. O'Crowley said one of her Korean friends thanked her for her efforts on behalf of Korea and reminded her that she needed to continue to work hard for the Korean people. Perhaps with that in mind, she closed her speech telling the class that she pleased by the confidence Korea Tourism Organization had in her and was very proud of the opportunity to represent Korea. Leaving the students with the final words of advice, "You are the future of Korea tourism and I am depending on you." Following the seminar, O'Crowley fielded a number of questions from the students then joined Prof. Mason for a cup of very special green tea from the Jirisan (Mt. Jiri) area and a briefing on the Baek Du San Dae Kan Project, two areas of Mason's Korean expertise. Mason, a 23-year resident of Korea explained that two hikers from New Zealand are currently making the trek and expect to arrive in Seoraksan (Mt. Seorak) in early November. O'Crowley found the subject a fascinating saying, "This is an exciting development and one that I hope we at the Korea Tourism Organization can use to promote Korean tourism opportunities to the adventure market. I wish I could be there when they cross the finish line."